Apo Island is a volcanic island covering 12 hectares in land area, 7 kilometers off the southeastern tip of Negros Island and 30 kilometers south of the Negros Oriental capital of Dumaguete City in the Philippines. The marine habitat around the island is a marine reserve, protected by the National Integrated Protected Area Act (NIPA) and under the jurisdiction of the Protected Area Management Board (PAMB). It has become a popular dive site and snorkeling destination with tourists. There are two resorts on Apo Island, both of which have their own dive centers: Apo Island Beach Resort and Liberty's Lodge. The island is under the jurisdiction of the municipality of Dauin, Negros Oriental, and is one of the municipality's 23 barangays. As of the 2007 census, the island has a population of 745. Apo Island is one of the world's best known community-organized marine sanctuaries, and as such it has been well documented by the global science community. The project was started when Dr. Angel Alcala, a marine scientist from the Silliman University Marine Laboratory explained to the local fishermen the importance of creating a marine sanctuary in the area. Initially, there was hesitation on the part of the locals; but after a 3-year dialogue, Dr. Alcala was able to convince the island community to establish the sanctuary. Assisted by the staff of the SU Marine Laboratory in 1982, the local fishermen selected an area along 450 meters of shoreline and extending 500 meters from shore as the sanctuary site. Since then, the project initiated on the island led to the creation of hundreds of other marine sanctuaries in the Philippines. 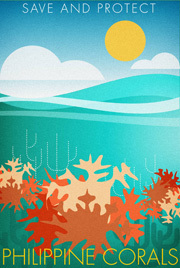 At present, the island is home to over 650 documented species of fish and estimated to have over 400 species of corals. Visitors and tourists pay a fee to enter Apo Island and to snorkel or dive in the marine sanctuary there, these fees are used to keep the sanctuary clean and in good condition. Upon arrival, head for the registration office at the beach where you can pay the fee of Php100/person. The rate goes down for minors and is hugely discounted for Dauin residents who get to pay only Php10.00 upon presentation of their community tax certificates, as Apo Island is under the jurisdiction of the municipality of Dauin. This entrance fee is actually a marine sanctuary fee that is used towards the maintenance and preservation of the island, keeping the coral reefs pristine and to be able to keep it as a world class coral reef for everyone to enjoy. Should you wish to stay overnight, there are two reasonably-priced resorts on either side of the small island with reasonable accommodation rates for you to choose from. But please know that the electricity power is switched off at night, although Apo Island Beach Resort has its own generator which is run for a few hours more after the island powers off while Liberty's Community House's electricity relies on the local power source. At night, one great activity, besides having an island cocktail perhaps, would be stargazing from the beach where billions of twinkle at you from the heavens. Most divers don't mind the early lights out because they prefer to turn in early anyway to start out as early as possible to maximize their time exploring the reef. Activities include swimming, sunbathing, snorkeling, diving, cooking your own meals (there are barbecue grills for rent but cooking your own food does take time away from diving and snorkeling), hiking up to the light house, and basically just relaxing amid rare natural beauty. Make sure you take EVERYTHING you brought back with you, your gear and even your trash. Please note that you may not bring home any shells or corals as souvenirs, which is why wearing gloves underwater is strictly probihited (in other words, touch nothing!). There are souvenirs for sale on the island, and you may want to buy some commemorative t-shirts. These and the photos you took, as well as the sights you have beheld should be more than enough wonderful memories to bring back home with you. As mentioned earlier, make sure you are on your boat and heading back out before 4:00pm, unless you want to stay another night on the island, which of course may not seem a bad idea at all! You must go to the Dumaguete harbor to get your ticket. Apo Island may be visited via a day trip from Dumaguete or one may prefer to book several days to be able to enjoy all the underwater vistas that Apo Island has to offer. To get there, one may take a Ceres bus that heads for Bayawan City that passes through Zamboanguita. Just have a multicab take you to the Ceres terminal (cost is bout Php8.00). The bus ride costs about Php50/person. Make sure to tell the conductor that you will be dropped of at Malatapay in Zamboanguita. Malatapay is where the country market is held every Wednesday and a tourist attraction by itself.